In the southwest desert, it is necessary to protect gardens from rabbits, javelina, deer, skunks, rats, mice, birds and more. This can be done using a variety of techniques. While living with our native creatures can be frustrating, many native plants have survived in unprotected gardens for years. An Internet search on "critter resistant plants" with your state or city name will provide lists of plants that are distasteful to native animals. All new plantings outside of a rabbit-fenced area should be initially protected with chicken wire or other fencing that excludes baby rabbits. Baby rabbits can get through fencing with 2" diameter holes. Wrap all new tree trunks with 1/2" wire mesh (loosely) and remove after one or two years. Apple tree bark is very tasty. In general, rabbits are most attracted to the bark of rose family plants, especially fruit trees. After mulching the planting hole surface, if the plant is outside a javelina-proof fence, place rocks or pavers on top of the mulch to prevent a hungry javelina from digging for grubs. Water in the early morning. If the ground is wet at night, critters may dig up plants to find the source of the water. Also fix all leaks in irrigation systems. Do not use FRESH compost. Critters will think that it is dinner time. Do not use blood meal or bone meal to fertilize plants. Critters will dig up the soil looking for the bone or the corpse. Place Rosemary clippings on planting surfaces. Critters do not like the smell. Plant distasteful plants between desirables to confuse the critters' noses. When a drought goes on for more than four weeks, critters start to get desperate. All plants that are watered in a drought, even if once a month, need to be protected against javelina, rabbits, rats and mice. Once a plant is watered in a drought, javelina or rabbits will dig it up and eat it even though they would not touch it unwatered. Consider fencing your garden or part of your yard to keep javelina and large critters at bay. Heavy-duty, four-foot-high field fencing supported by six-foot-long iron T-posts provides relatively inexpensive, secure fencing. T-posts are most easily driven into hard ground after a long, heavy rain. Four to eight foot high walls are used to keep out rabbits and javelina and offer wind protection. They do not keep out birds or skunks. Birds can, however, be kept at bay if a couple of cats are persuaded to patrol the garden. It is common to build raised vegetable garden beds having walls 18-24" high using masonry blocks. These deter rabbits. The walls have a concrete footing one foot deep that discourages some burrowing animals. A capstone with rounded edges is placed on top to allow people to sit. The width of the bed is often two arms' length so that gardeners can sit and tend the entire bed using both sides. The raised bed, filled with soil, is open at the bottom and allows excess water from monsoon rains to drain quickly, avoiding waterlogged roots. 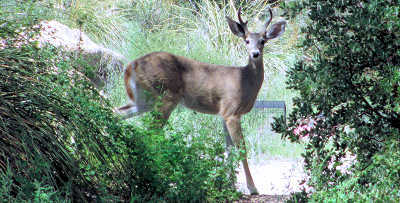 Plants can be placed in horse watering troughs or other tall containers that deter rabbits. The sides must be well protected from the sun to avoid overheating roots. The bottoms must have drainage holes to prevent soggy soil and fungal diseases. To keep burrowing animals out of the drainage holes, cover them with wire mesh, cover the mesh with gravel, then top with soil. Some plants may have their roots eaten by burrowing animals. Hanging baskets have been used to avoid the problem. Another solution is to use a wire cage that is buried in the ground. The plant is placed inside the cage and the damage is limited to roots outside the cage. Garden cages, using 1" wire mesh on sides and top, can keep out birds and critters smaller than javelina. They provide some wind protection when the sides are lined with 50% lattice four feet high. Burrowing rats will require 1/2" wire mesh on the bottoms of raised garden beds. Paving brick or stone will be needed for interior walkways and the outer sides of the cage to control weeds and burrowing animals. Rabbits and rats can be kept out of a garden area with a one and one-half to two feet high chicken wire or 1" wire mesh fence. Mice can be kept out only with one-half inch wire mesh that covers an entire garden cage because they can climb and jump at least three feet high. Seedlings can be treated as a salad bowl by mice or rats, especially in droughts. Try a rat trap baited with a cherry tomato or a grape first. If nothing is caught, switch to mouse traps. When mechanical traps do not work, a cage made of 1/4" or 1/2" wire mesh can be constructed to cover the seedling bed. Such a cage has the advantage of providing filtered shade to the seedlings it surrounds. The cage is removed when the seedling is robust enough to deter mice or is too large for the cage. If your low-hanging tomatoes have been nibbled, think mice, not lizards. Mice love tomatoes but cannot easily climb tomato plants. Mouse traps should be baited with fruit such as grapes or a bit of tomato. While while mice do not eat peppermint, rats will, and they can tolerate its presence. A hungry rat will eat lettuce and green onions growing next to a peppermint plant. If you grow strawberries, they are in danger from some lizard species, mice, rats and birds. A cage of 1/4" to 1/2" wire mesh over your garden bed is necessary to protect strawberries. If a large chunk is eaten out of some fruit, consider the possibility of grasshoppers. Smaller holes can be fruitworms or bird pecks. Grasshoppers can be deterred with a garlic-Habanero spray. Drop four peeled garlic cloves and four Habanero peppers into a blender with two cups of water. Grind well, let set for two days, filter out the solids, then spray on anything being eaten by grasshoppers. Some species of desert rats like to burrow under prickly pear cactus. This cactus needs to be eliminated within 30-50' of a garden to avoid giving rats easy shelter. The cactus is also used by rats as a food source. Other easy places for rodents to burrow are piles of loose dirt and thick mulch.